Nervousness in front of a crowd is normal. It gets worse when the intended speaker has, absolutely, no idea what to do. A particular difficulty is to keep the audience engaged and keep them from dozing off in the middle of the presentation. At times, the audience would get lost from all the jargon, inaudible words, negative body language, and, others. Speaking is a skill that needs regular and steady practice. To captivate an audience requires more preparation and application of the right technique. Body language on the stage is also essential to emphasize the right messages. A combination of these skills can give the speaker an advantage of overcoming nervousness and an increase in self-esteem and public speaking confidence. Barbara Seymour Giordano is a communication specialist for StudyWorksLA.com. She has a few techniques up her sleeves which she shared to Inc. last 2015. She emphasizes the importance of preparation and the use of a script when arranging presentations. Keeping the other details aligned with the text helps the audience understand every bit of information presented. She had mentioned in the interview about having the presentation casual, and, conversational so the audience can relate. It is, still, necessary, however, to use the appropriate tone and formality of the presentation as per the type and the audience. Other cultures will need special consideration, and, sensitivity during the exhibition. This course seeks to guide individuals on how to engage the audience during public speaking events. It’ll give them pointers to equip for the entire duration of a public speaking event. 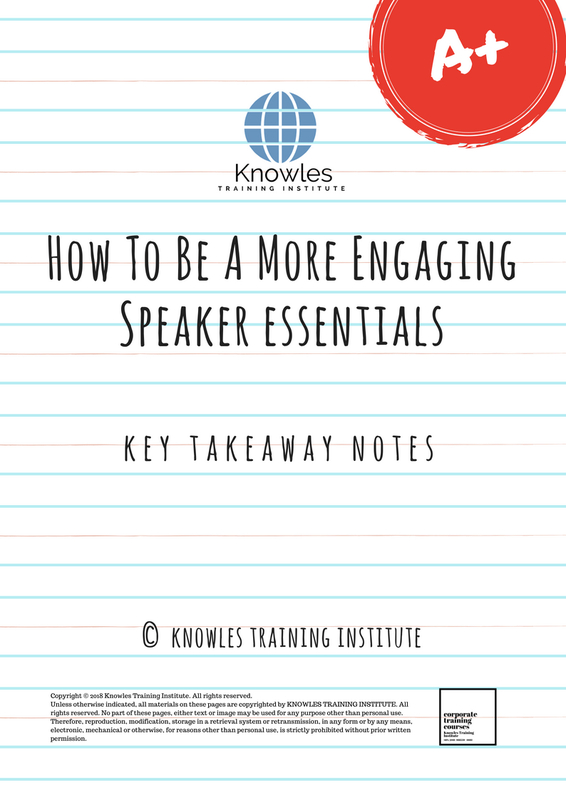 This How To Be A More Engaging Speaker workshop is ideal for anyone who would like to gain a strong grasp and improve their How To Be A More Engaging Speaker. The duration of this How To Be A More Engaging Speaker workshop is 1 full day. Knowles Training Institute will also be able to contextualised this workshop according to different durations; 2 full days, 1 day, half day, 90 minutes and 60 minutes. Enables individuals to, suitably, evaluate the needs of the audience. Improve audience participation throughout the event. Boost self-esteem and confidence when speaking in front of a crowd. Improve the use of body language to captivate the audience. Avoid cultural blunders during speaking events through proper preparation. Increase chances or opportunities to do similar activities in the future. Decrease nervousness felt before and during the public speaking event. Identify steps to prepare for a public speaking event. Observe successful public speakers for reference. Interact with the audience during the public speaking exercise. Identify different cultural needs of different audiences. Study the use of body language for public speaking events. Create a script for the public speaking exercise using a topic of choice. Sequence the presentation in a coherent and comprehensive flow. Criticize own presentation for self-awareness and reference for improvement. Practice presentation repeatedly before the event to gain self-confidence in the delivery. Explore personal public speaking events in the area for observation purposes. Visualize oneself in front of the crowd during the event proper. Layout movements and stage blocking beforehand so the audience will not have a hard time looking at you and the presentation. How do you become a more engaging speaker? How to keep your audience awake? How to engage an audience during your next presentation? What are the preparations to be done before the event? How do you make a convincing and engaging script? What cultural considerations are there when speaking to different audiences? How to use body language when emphasizing a point? How do you keep the presentation flowing? Observation of successful public speakers. Public speaking practice with a topic of choice. Evaluate public speaking exercise for future improvement and reference. 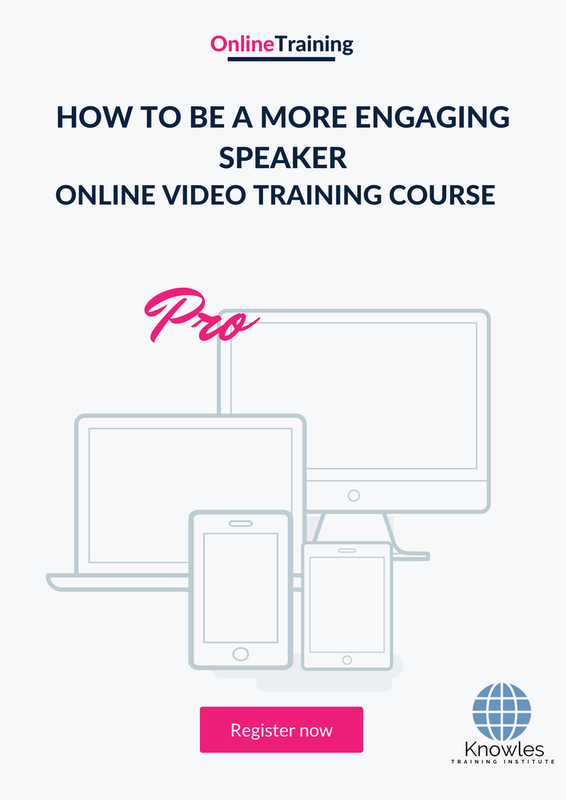 There are 3 pricing options available for this How To Be A More Engaging Speaker training course. 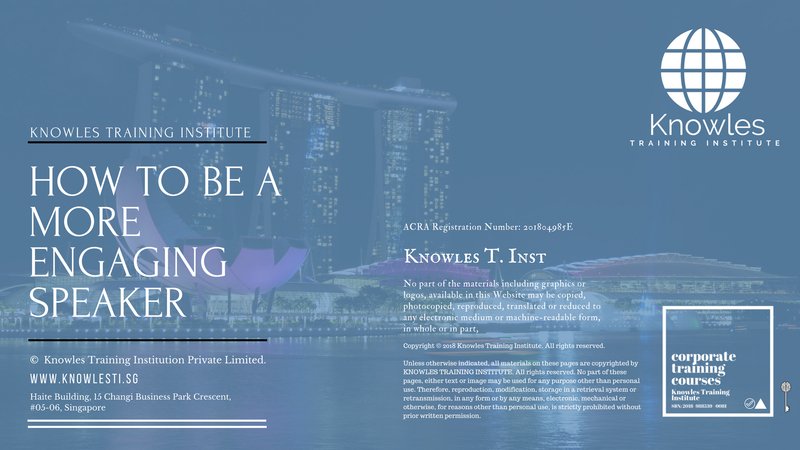 Course participants not in Singapore may choose to sign up for our online How To Be A More Engaging Speaker training course. 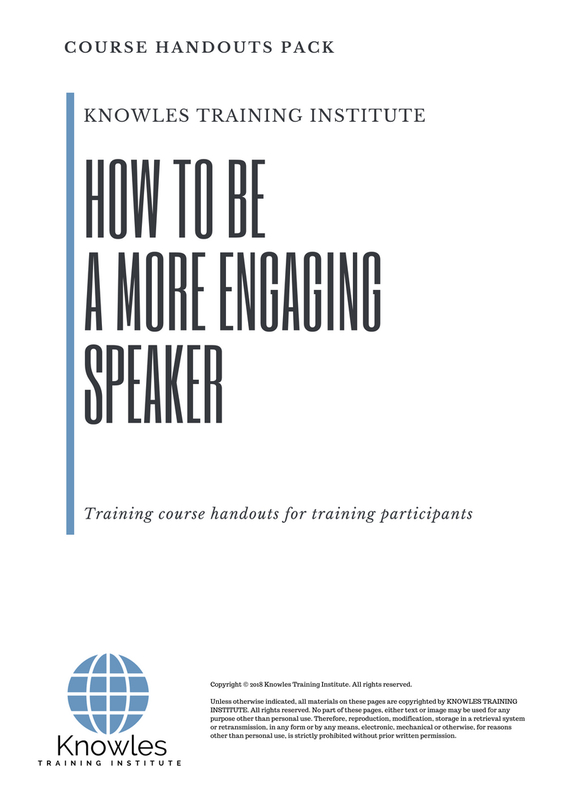 Request for this How To Be A More Engaging Speaker course brochure. Fill up the short information below and we will send it to you right away! 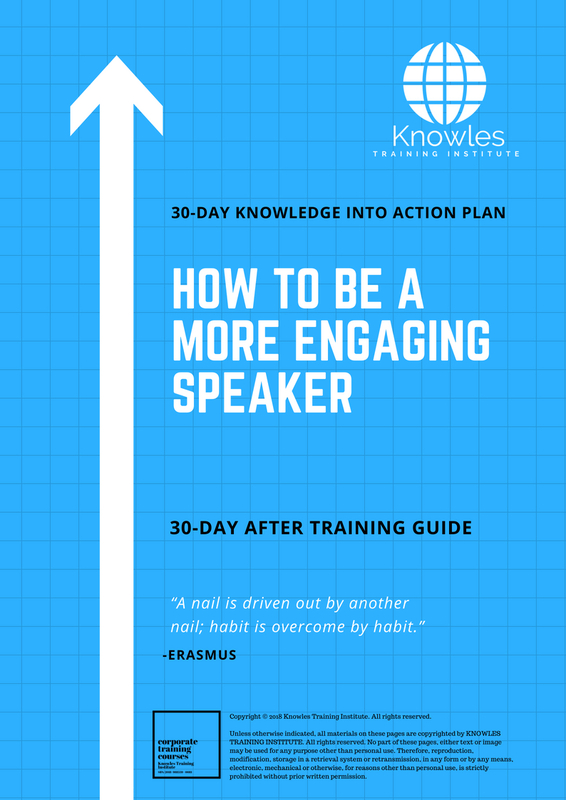 Register For This How To Be A More Engaging Speaker Course Now! 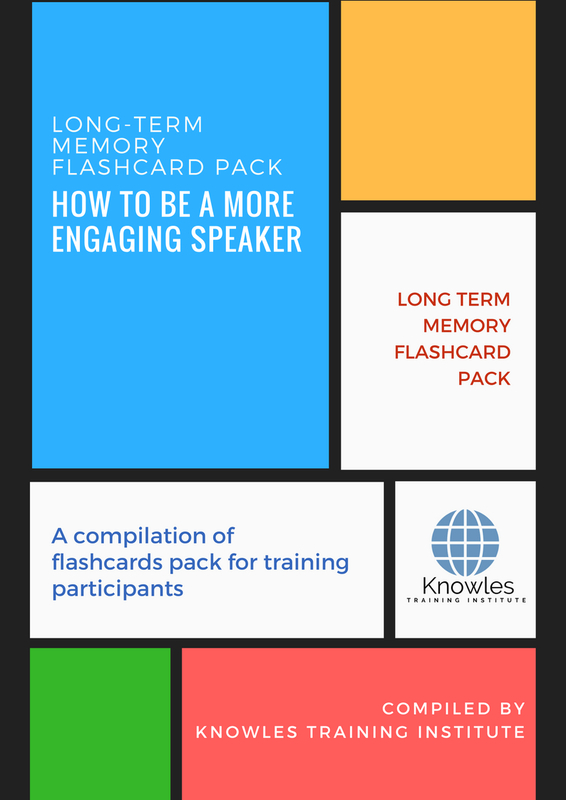 Share This How To Be A More Engaging Speaker Training Course! 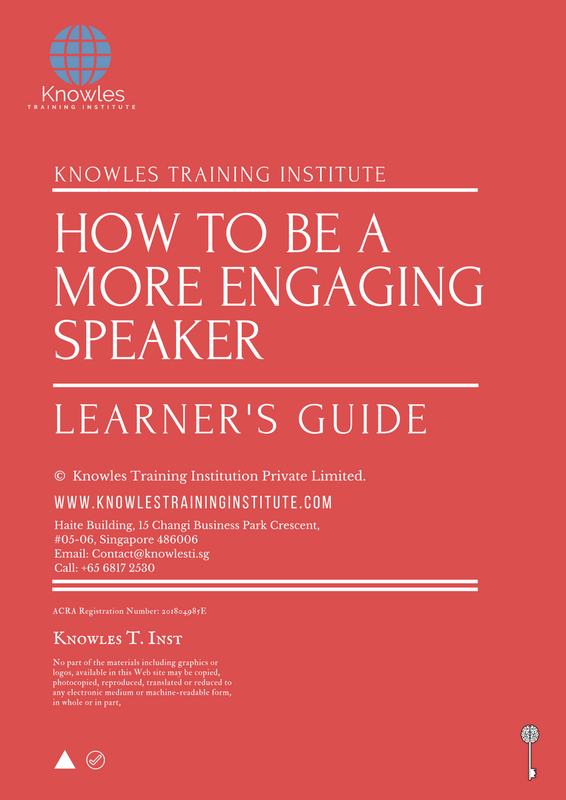 How To Be A More Engaging Speaker course, workshop, training, class, seminar, talk, program, programme, activity, lecture. 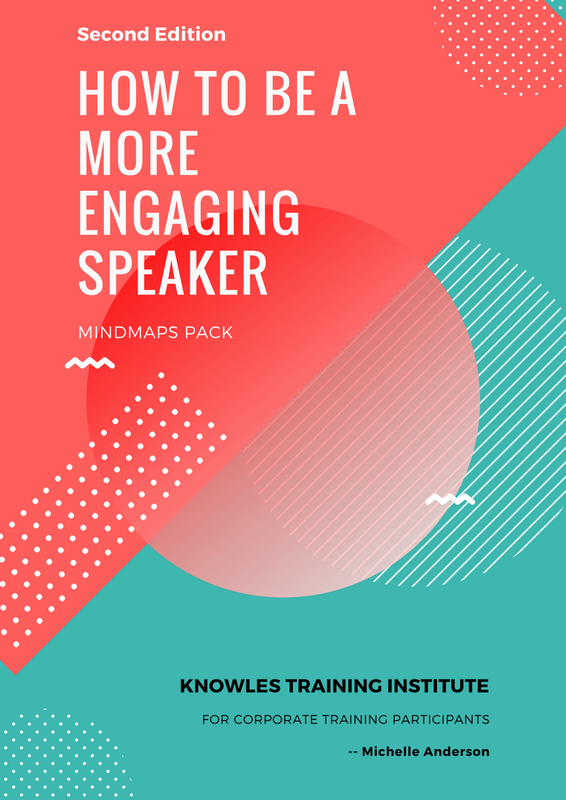 How To Be A More Engaging Speaker courses, workshops, classes, seminars, talks, programs, programmes, activities, lectures in Singapore. How To Be A More Engaging Speaker improvement tips, How To Be A More Engaging Speaker techniques, improve How To Be A More Engaging Speaker, improve How To Be A More Engaging Speaker games, How To Be A More Engaging Speaker improvement exercises, improve How To Be A More Engaging Speaker power, how to have good How To Be A More Engaging Speaker, how to have good How To Be A More Engaging Speaker in studying, how to build up your How To Be A More Engaging Speaker, how to improve How To Be A More Engaging Speaker how to improve How To Be A More Engaging Speaker course in Singapore. 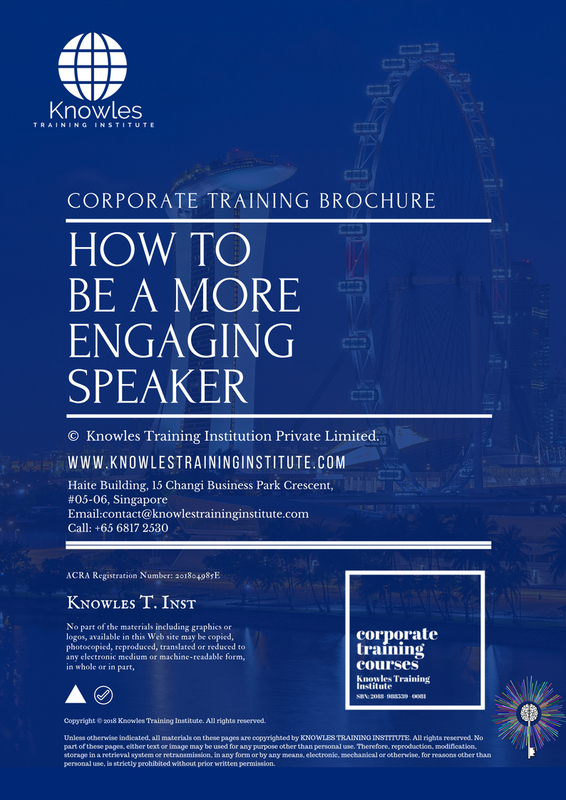 Enhance, boost, build up, enlarge, heighten How To Be A More Engaging Speaker course in Singapore. 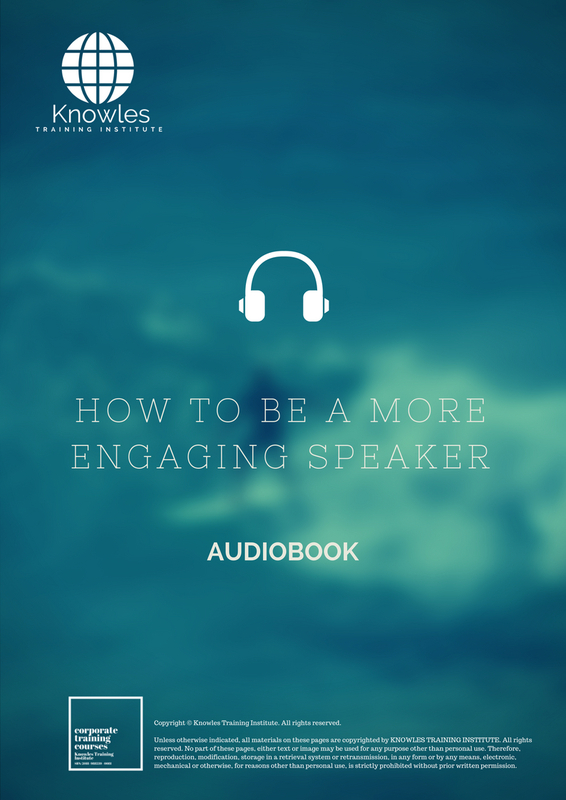 Increase, intensify, raise, reinforce, strengthen How To Be A More Engaging Speaker. 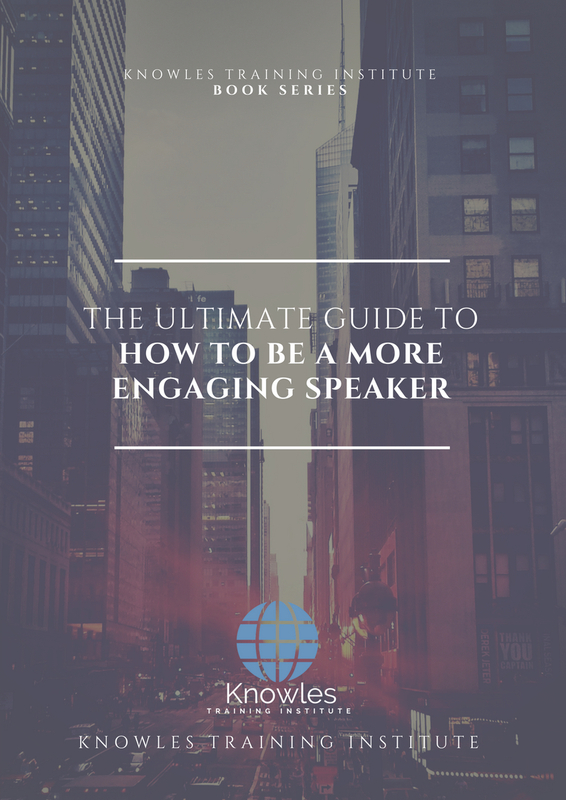 Upgrade, amplify, boom, elevate, exaggerate, magnify, grow, gain How To Be A More Engaging Speaker. Develop How To Be A More Engaging Speaker, multiple, power up, beef up, bolster, establish, extend How To Be A More Engaging Speaker. Invigorate, restore, step up, toughen, empower, fortify, regenerate How To Be A More Engaging Speaker. Rejuvenate, renew, escalate, expand, maximize How To Be A More Engaging Speaker. Powerful, mighty, impressive, competent, great, excellent, exceptional How To Be A More Engaging Speaker in Singapore. 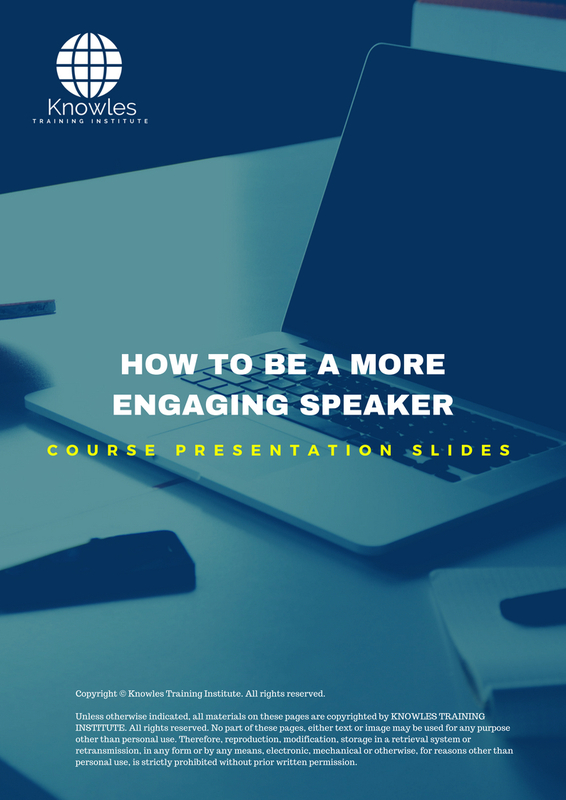 Superb How To Be A More Engaging Speaker. Super, superior, strong, solid, active How To Be A More Engaging Speaker training courses and workshops in Singapore. How To Be A More Engaging Speaker enhancement, booster, building up, enlargement, heightening, increment, strengthening, amplification. How To Be A More Engaging Speaker magnification, growth, development, power, empowerment, regeneration. How To Be A More Engaging Speaker rejuvenation, development, escalation, expansion. How To Be A More Engaging Speaker maximization, power training courses & workshops in Singapore.